Kiss Alive is one of the most famous and successful live albums ever. It was recorded and released in 1975 and captured the rawness of Kiss live in concert. Kiss were a notorious live act with the theatrics and the costumes adding to the atmosphere created by their powerful, driving, forceful music. Unfortunately this sound wasn’t properly captured on the first three studio albums – Kiss, Hotter Than Hell and Dressed to Kill. It was on Kiss Alive! 7 tracks from Kiss, 5 from Hotter Than Hell and 4 from Dressed To Kill. A full review will be written later. Here are some videos of Kiss performing live in concert in 1975. Kiss Alive is recognised as one of the greatest live albums ever. Reviewers at Amazon love it. I also found this documentary on Kiss Alive when I was browsing through YouTube. What Do You Think About Kiss Alive? 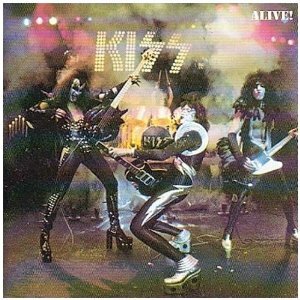 Do you agree that Kiss Alive is one of the best live albums ever? Is it the best Kiss live album? 1975 to 96 - You Wanted the Best, You Got the Best!! I use readers polls to help find the best live albums. This entry was posted in 1970s Live Albums, Heavy Metal Live Albums and tagged 1970s hard rock, 1975 live albums, heavy metal 1975, Kiss Live Albums by Paul Simister. Bookmark the permalink.